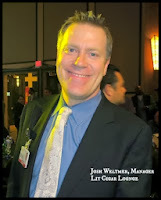 Lit Newsletter 1/22/14 Our Last Jan. Event, Stock Up For The Game! Join us on Friday, January 31 from 6-8 pm in Lit as we feature cigars from La Aurora and Miami Cigar & Co. along with beer from Redmond's Mac & Jack's Brewery. We'll be joined by Ed Ryan from Miami Cigar, who has arranged for us to have special commemorative footballs available for this event! 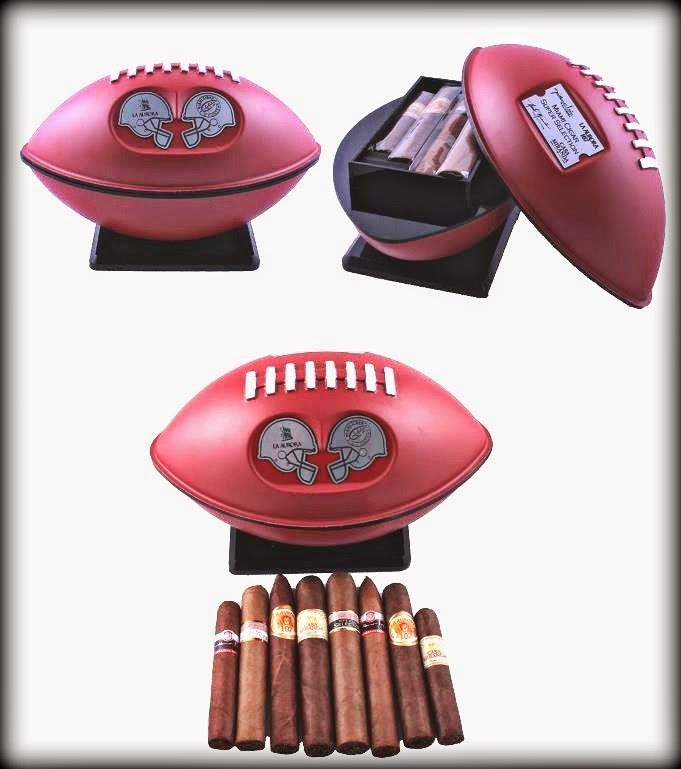 Originally, these cigar-filled footballs were designed for events at the big game in New York, but because the Seahawks have made it, we'll be getting some as well! There are only a few available and they won't last long! 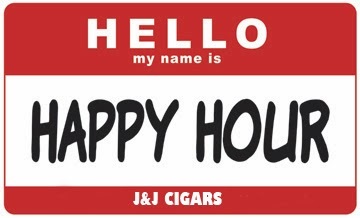 We'll also have special deals on Guillermo Leon, Fernando Leon and La Aurora cigars, and will be offering both Mac & Jack's African Amber and CU Lator Barleywine Ale during the event! It's the perfect time to stock up on cigars for your big party later that weekend! There are still a few spaces left for our special tasting of Hennessy Cognac in Lit on Tuesday, January 28th from 7-9pm. 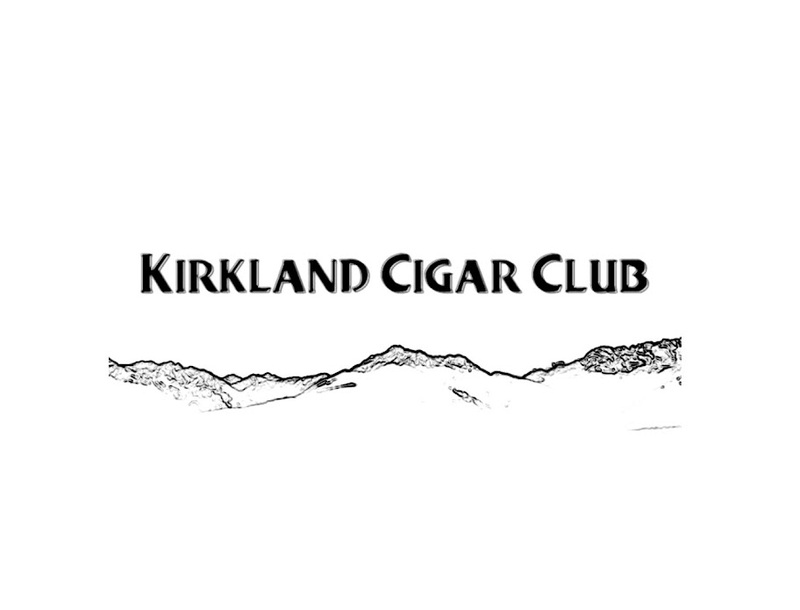 If you'd like to attend this $95 event, which includes a flight of Hennessy's most prestigious marques: XO, Paradis Extra, and Richard Hennessy, along with a rare Cohiba Edición Diamante cigar, featuring a 34 year old Cameroon wrapper from the vintage crop of 1980, please reply to this email or call 425-888-7978 to RSVP. 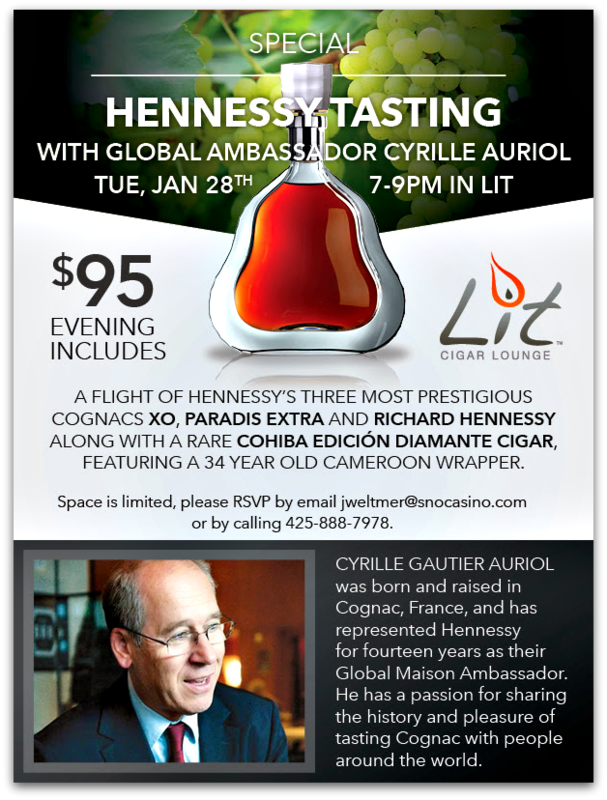 We'll be joined by Hennessy's global brand ambassador Cyrille Auriol, who will guide us through the intense spectrum of flavors represented by these amazing cognacs, aged up to 200 years! The lounge will be reserved exclusively for those attending this tasting during the hours of 7-9pm on January 28. 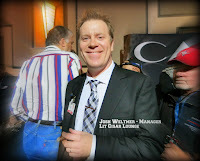 We are also hosting a private event in the lounge on Sunday, February 2 from 2-8pm. The humidor will still be open during this time for cigar purchases. We apologize for any inconvenience. Partagas Master Blender Benji Menendez has retired after 62 years in the cigar business. 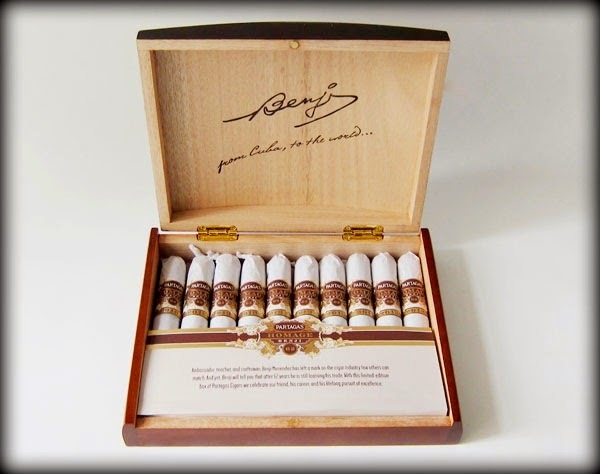 To honor their living legend, Partagas has released a limited edition Benji Homage cigar. 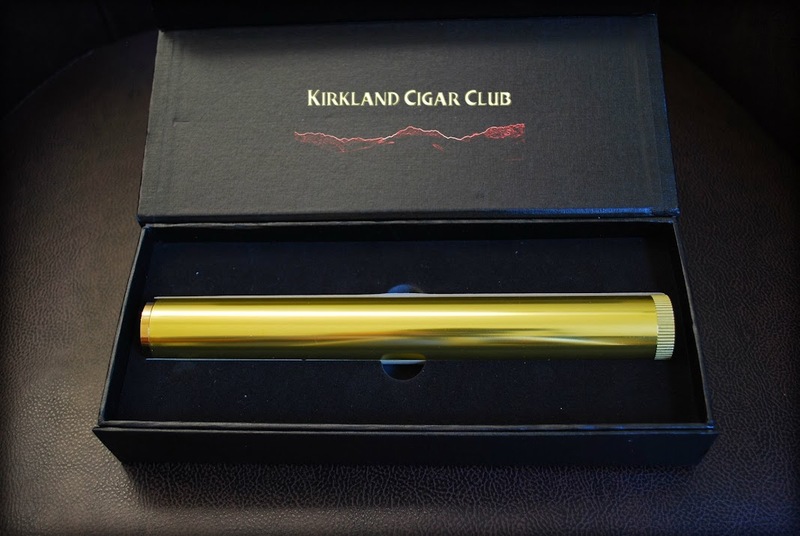 Featuring a Olancho San Augustin wrapper, Broadleaf binder and a full bodied filler blend of Dominican and Nicaraguan tobaccos, this cigar is a must try while they're available. We also have a few new cigars from Illusione, the Cruzado Marelas Supremas and the ~r~ Rothschildes, both great cigars. The links are to reviews from halfwheel. New from Rocky Patel, we have the Vintage 2003 Cameroon and the Edge Sumatra, both great choices for sweet, rich cigars at under $10 a piece! 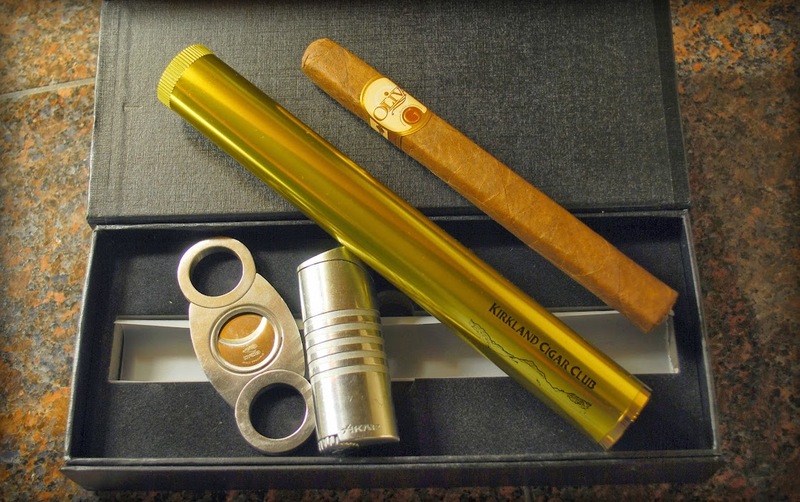 If you’re like me, I’m sure you have more than one cigar lighter, and as far as cigar cutters go, you've probably got a drawer full of them, but travel humidors for a single cigar? Yeah right, why would I need that? 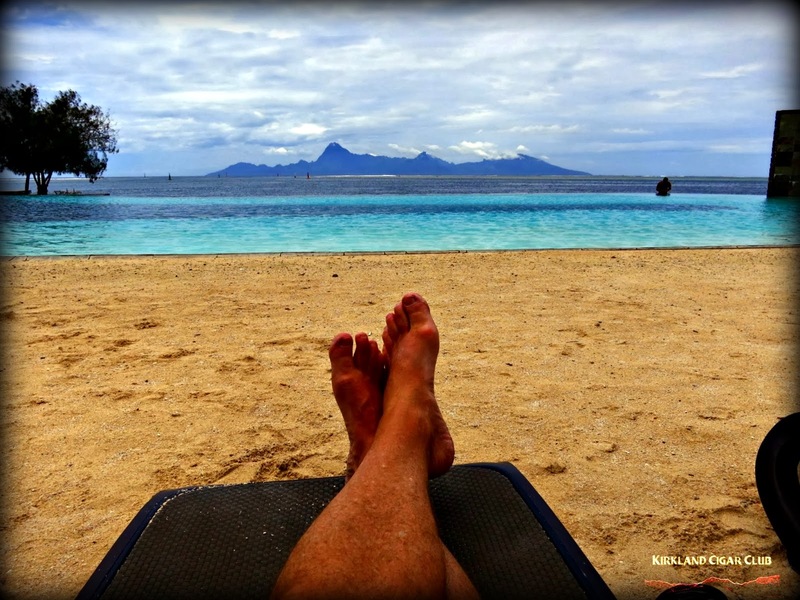 A single cigar humidor is more practical than you might imagine, I mean think about it, how often do you go someplace and smoke more than one cigar? I know, I know, there are exceptions to the rules, but 90% of the time you’re just going to smoke one and go home, right? Now I know a lot of you guys like to carry around those cases that hold a ton of cigars, you know which ones I’m talking about, they’re made of plastic and look like they were built for military use; pretty rugged. Well, those aren't my style. So I’ll tell you a few other little observations – If you have one of these and you’re traveling, I suggest that you put it in your checked luggage, not your carry-on. Why? Well, if you run it through the TSA scanner at airport security, it basically looks like a stick of dynamite to them. They’ll stop you every time. Put it in your checked bag and no one will be the wiser. 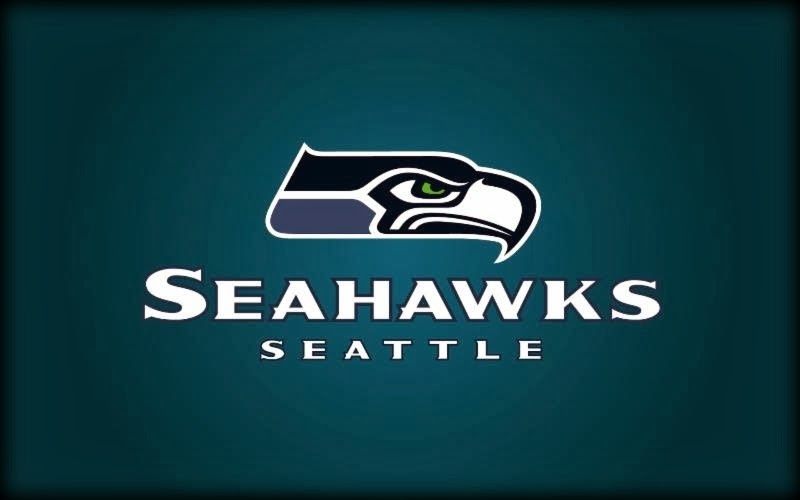 J&J Cigars: Seahawks tailgate party this Sunday @ J&J - 20% OFF!!! SEAHAWKS NFC CHAMPIONSHIP GAME TAILGATE PARTY!!! 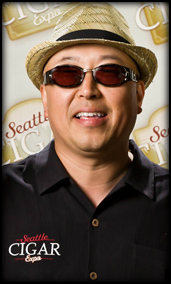 Please join us at J&J Cigars in SODO for a tailgate party this Sunday, January 19th from 11am-3pm. We will be offering 20% off on all inventory except for limited series and Davidoff. 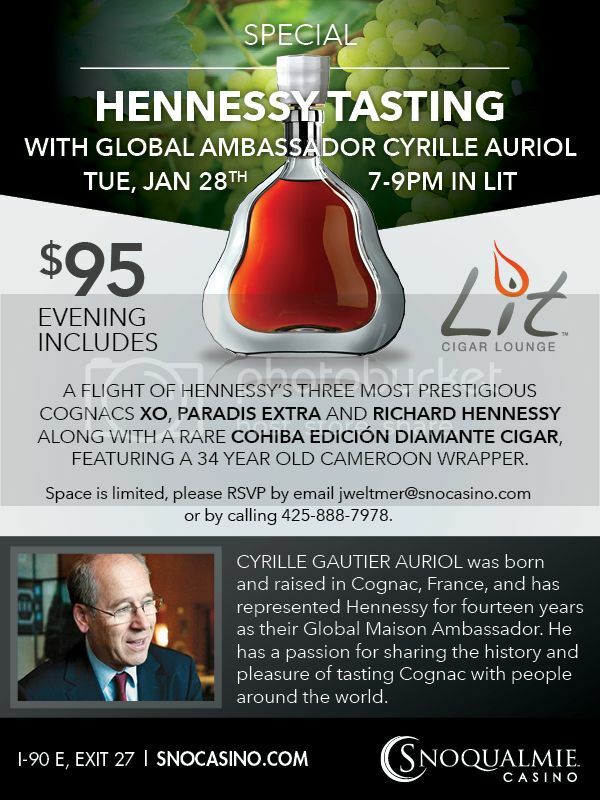 We will be holding a special tasting of Hennessy Cognac in Lit on Tuesday, January 28th from 7-9pm. There is limited space available for this $95 event, which includes a flight of Hennessy's most prestigious marques: XO, Paradis Extra, and Richard Hennessy. This is a great opportunity to taste these great products, aged as long as 200 years, at a fraction of their retail price! The tasting will also include a rare Cohiba Edición Diamante cigar, featuring a 34 year old Cameroon wrapper from the vintage crop of 1980! We'll be joined by Hennessy's global brand ambassador Cyrille Auriol, who will guide us through the intense spectrum of flavors represented in these amazing cognacs. If you are interested in attending, please RSVP by emailing jweltmer@snocasino.com, replying to this email, or calling 425-888-7978. Please respond quickly as space is limited. The lounge will be reserved exclusively for those attending this tasting during the hours of 7-9pm on January 28. We apologize for any inconvenience. Please join us tomorrow, Thursday January 16 in Lit from 6-8pm as we feature cigars by Foundry Tobacco Co. and Whisky from Pendleton. We'll have ambassadors on hand from both brands and plenty of great deals and prizes to give away! We hope to see you there! On Sunday, February 2, our lounge is reserved for a private event from 2-8pm. 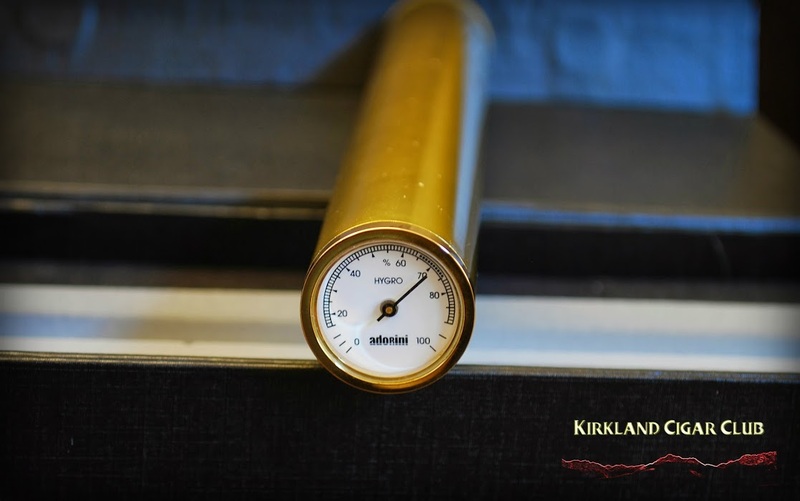 Our humidor will be open throughout the day for cigar purchase, however. We apologize for any inconvenience. Never assume that they sell cigars where you're going! Anyway, we had a great time - beautiful beaches, crystal clear water, friendly people, and sting rays/manta rays all over the fricking place! Unbelievable! Amazing to watch them glide along so gracefully so close to you. 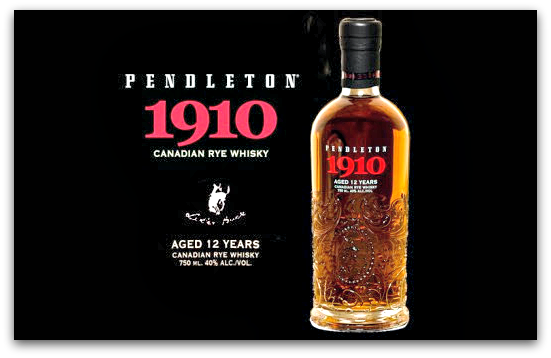 Please join us on Thursday, January 16th in Lit from 6-8pm as we feature cigars by Foundry Tobacco Co. and whisky from Pendleton. 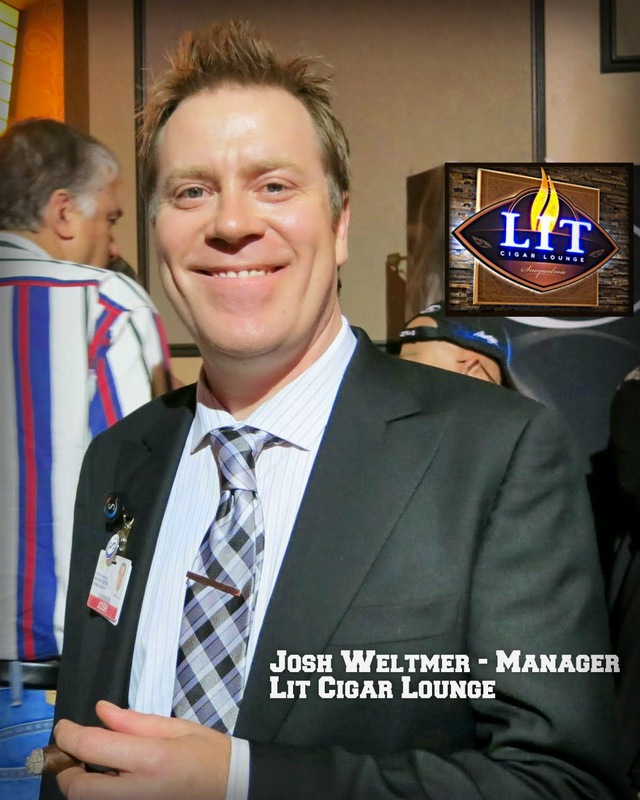 We'll be joined by our good friend Patrick Dewitt of General Cigar as we do our first event featuring the Foundry cigars, which are easily the most popular new cigar brand we've seen in several years. We'll have deals on both series of Foundry cigars, along with the new Compounds, Elements & Musings line. Here's a review of the Foundry Shoreham from The Humidor Blog to whet your appetite! 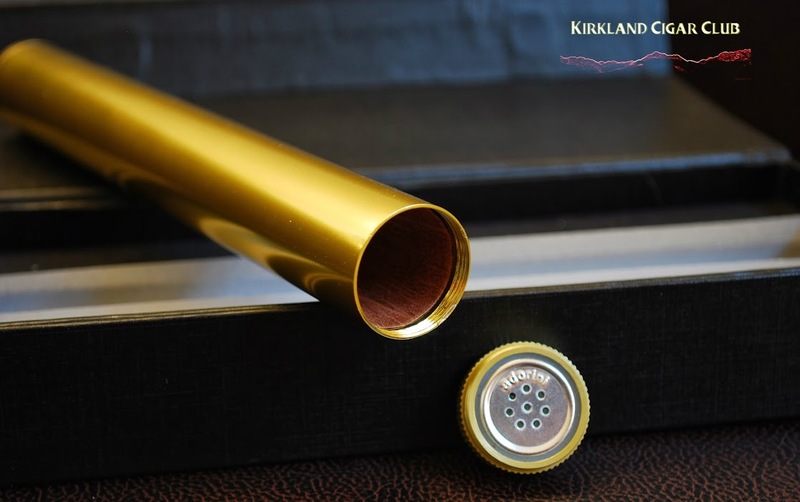 Prizes include a stunning travel humidor, which uses the gear from the Foundry Wells cigar as a secret key! 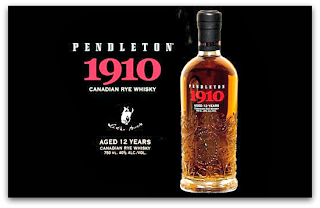 Also joining us on this evening is Matt from Pendleton Whisky as we feature drink specials on the original Pendleton and the 12 year old 1910 Rye. We hope to see you at Lit for this great event! 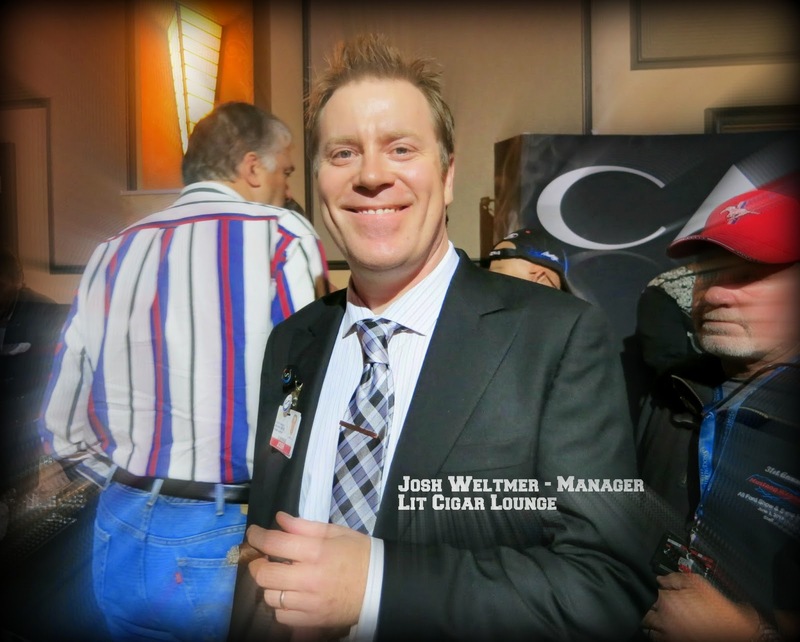 Note: Our lounge area will be reserved for a private event on Sunday, February 2 from 2-8pm. We apologize for any inconvenience this may cause. Our humidor will still be open for cigar purchases during this time. If you haven't had the chance to peruse the latest issue of Cigar Aficionado featuring their Top 25 Cigars of 2013, you can see the entire list here. 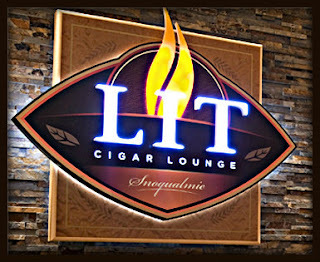 You can find many of the cigars on this list at Lit, including the #2 cigar of the year, Aging Room Quattro F55. 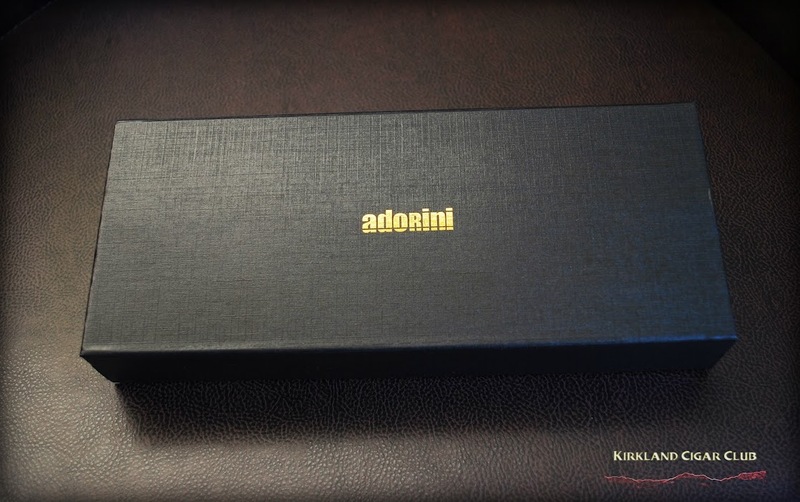 It's a delicious full bodied cigar with a box press that wowed the editors who gave it a 95 rating! 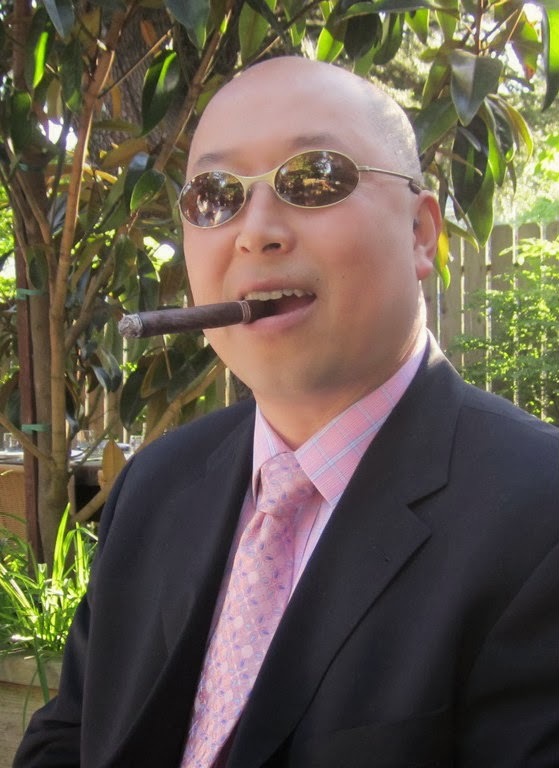 You can also find Top 25 cigars from Ashton, Gurkha, Padron, Arturo Fuente, La Flor Dominicana, Fernando Leon, La Aroma De Cuba, Casa Magna, My Father, Alec Bradley and Romeo y Julieta!